Not only do you run the risk of invalidating the manufacturers 12 month glue gun warranty by using competitor glue slugs within the Tec glue gun, you also run the risk of serious burns! Below is a series of pictures of a recently returned Tec 3200 glue gun where the customer has used competitor glue slugs that are seriously undersized and as such failed to seal the barrel in Tec 3200 glue gun. 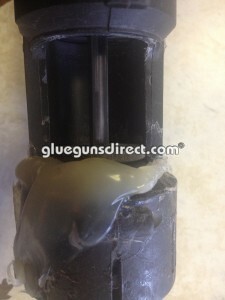 These slugs in question would fail within any of the Tec 43mm glue guns! 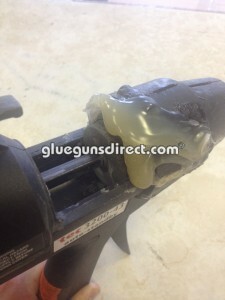 In these pictures you can see a Tec 3200 glue gun which had been left on unused for a period of time and on depressing the trigger molten adhesive has come back past the glue cartridge and exit via the breach of the glue gun over the operators hand. This adhesive will be close to 200C and will result in very serious burns! It is vital that the correct specified Tecbond glue slugs are used in all our 43 mm Tec glue guns for both reliability and safety reasons. Tecbond 43mm glue formulation have a unique size specification to allow for the different rates of expansion the different formulations have. It is not the case of one size fits all ! Tecbond 43mm glue slugs are designed for the smooth running within all Tec 43mm glue guns. 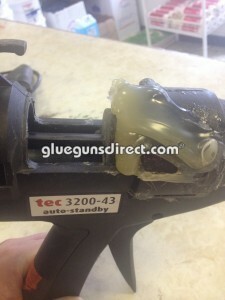 We would strongly recommend you only use Tecbond 43mm glue slugs in all our Tec 43mm glue guns, if you are using competitor glue slugs within our Tec 43mm range of glue guns we strongly recommend you stop using them with immediate effect and contact a member of our technical team for further advice. Some of these competitor glue slugs are simply not suitable for use in our Tec 43mm glue guns and are potentially dangerous. Tec 43mm glue guns and Tecbond 43mm glue slugs are made in the UK to a very high standard and are the only known UK manufacture of both glue guns and glue slugs offering a proven “gluing” system of quality.